Replacement air filter for Honda CB1100. Champion brand. NGK spark plugs as recommended for Honda CB1100 (2012+). Quality chain and sprocket kit for Honda CB1300 from 2003 to 2013. Includes chain, front sprocket and rear sprocket. Replacement air filter for Honda CB500 from 1994-2003. Replacement air filter for Honda CBF1000 from 2006 and after. Front brake discs made of high quality stainless steel. Your bike has two front discs, take quantity = 2. Replacement air filters for Honda CBR1000RR Fireblade (2005-2016). Bosch UR09CC Spark Plugs as recommended by Honda for CBR125R. High-quality sintered brake pads for high-performance stopping power. Replacement air filter for Honda CBR600F. NGK Spark Plugs as recommended by Honda for CBR600F and CBR600RR. Replacement air filter for Honda CBR600RR. Replacement air filter for Honda CBR900RR Fireblade (1992-2003). Your bike has two discs, take quantity = 2. NGK Spark Plugs as recommended by Honda for CBR900RR Fireblade. 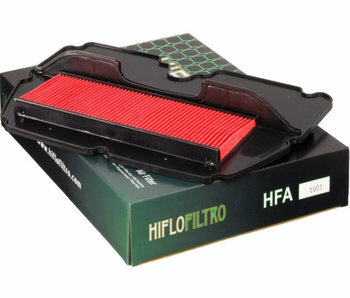 Replacement air filter for Honda NT650 and NT700 Deauville. NGK Spark Plugs as recommended by Honda for NT650/700 Deauville. Pair of fork rubber gaiters for Honda NT650 Bros, NT650 Deauville and NTV 650 Revere - these models have weak fork dust seals, problem solved with these gaiters ! Replacement air filter for Honda NT650 Hawk/Bros et NTV650 Revere. Quality chain and sprocket kit for Honda NT650 Bros/Hawk from 1988 to 1992. Includes chain, front sprocket and rear sprocket.